The Barbican's autumn show takes as its subject OMA, or the Office for Metropolitan Architecture, the Rotterdam-based practice headed by Rem Koolhaas. 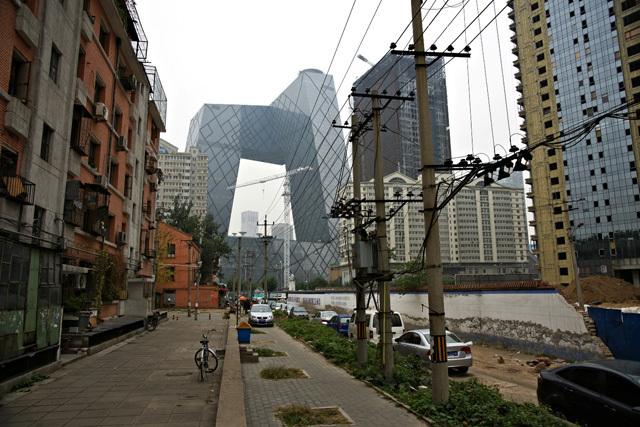 Cities from Seattle to Beijing, Porto to Las Vegas: all have been graced by OMA's geometrically daring designs, the most ambitious of which is the Chinese Central Television (CCTV) headquarters, pictured above. Until this year the practice had yet to build in London (the 2006 Serpentine pavilion notwithstanding), despite its origins in the 1970s at the Architectural Association in Bedford Square. However, 2011 saw the opening of their first London project, a headquarters for the Rothschilds bank, and they are at work on the masterplan for the redeveloped Commonwealth Institute in Kensington. All of which makes London the perfect setting for OMA's first major retrospective in a decade. Recent shows at the Barbican, such as the Surreal House, have had fun trying to change the gallery's forbidding contours. OMA / Progress goes even further by doing something that no show has ever done: open up the western entrance. Much of the lower floor is turned into a public passageway through which people can walk from the Barbican estate straight into the exhibition. This section of the gallery is free, and contains details of every project OMA has ever worked on; indeed, one might wonder if the curators have given away too much, and punters could find themselves sated without needing to fork out for the exhibition itself. That would be a shame, as this is a retrospective to delight both architectural wonks and those curious about what exactly those in the profession get up to. OMA had very little to do with the show's format, which was handled by Belgian collective Rotor, whose iconoclastic approach is dictated at the outset: "the problem with architecture exhibitions is that they can't show you what they promise: architecture". Thus what you'll find inside isn't just dry scale models (though they are around) but lots of strange objects: bits of sample material, blasted artefacts that are the result of strange experiments, rooms dedicated to the colour white or to bits of buildings that move or to items retrieved from wastebaskets at OMA's office on a particular day. The overall effect is a collection of concepts and ideas that attempts to conjure what working within the practice is like, not merely a list of things it has constructed. OMA / Progress might not quite solve the "problem of architecture exhibitions", but comes closer than any recent show in London has done.